I’ve been reading Perfectly Reasonable Deviations, and I’ve also been rereading Genius. A Nobel Prize-winning physicist, a loving husband and father, an enthusiastic teacher, a surprisingly accomplished bongo player, and a genius of the highest caliber---Richard P. Feynman was all these and more. 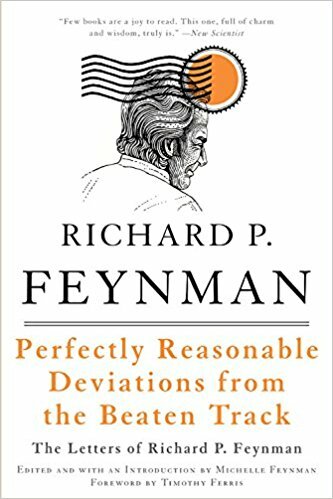 Perfectly Reasonable Deviations From the Beaten Track--collecting over forty years' worth of Feynman's letters--offers an unprecedented look at the writer and thinker whose scientific mind and lust for life made him a legend in his own time. Containing missives to and from such scientific luminaries as Victor Weisskopf, Stephen Wolfram, James Watson, and Edward Teller, as well as a remarkable selection of letters to and from fans, students, family, and people from around the world eager for Feynman's advice and counsel, Perfectly Reasonable Deviations From the Beaten Track not only illuminates the personal relationships that underwrote the key developments in modern science, but also forms the most intimate look at Feynman yet available. Feynman was a man many felt close to but few really knew, and this collection reveals the full wisdom and private passion of a personality that captivated everyone it touched. Perfectly Reasonable Deviations From the Beaten Track is an eloquent testimony to the virtue of approaching the world with an inquiring eye; it demonstrates the full extent of the Feynman legacy like never before. Edited and with additional commentary by his daughter Michelle, it's a must-read for Feynman fans everywhere, and for anyone seeking to better understand one of the towering figures--and defining personalities--of the twentieth century.